LA-Story.com: Chef Eric Shares His Favorite Foods for July 4th! 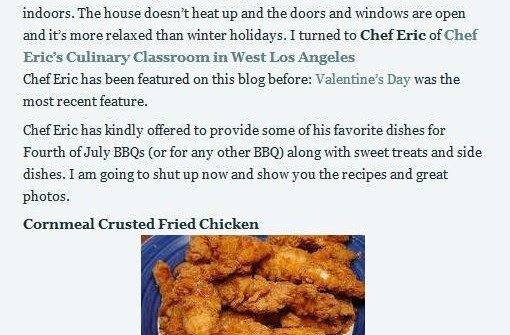 Chef Eric’s delicious 4th of July recipes were featured on LA-Story.com, which was a real treat! Check out the rest of the story here. Having the most fun and excellent learning experience attending your class. I am really enjoying it. Every time I get a chance to apply what I learned from school, I have my husband and friends as my fans. And you know what they said, [my cooking] tastes really like the food prepared by a professional chef! Sheldon and I want to thank you for a wonderful evening. Your enthusiasm and supportive nature made the class really fun. We look forward to taking more classes. This is the most fun I have had in years. Chef Eric is a terrific instructor. I have taken several of his classes and courses and keep coming back for more.